Yes folks, it's finally really happened. Today Palm announced that its dynamic duo -- the Pre Plus and Pixi Plus -- will be making their way to AT&T's network "in the coming months." We won't bore you with too many details on the devices, since you can read our review of the non-Plus Sprint variations here and here, and the Verizon versions right here. What we will tell you is that at an undisclosed time, the Pre Plus and Pixi Plus can be yours for just $149.99 and a deep-discount $49.99 (with a $100 mail-in rebate and two-year contract), respectively. The Pre Plus will be similarly equipped to its Verizon counterpart (16GB of storage, GPS, WiFi, Bluetooth 2.1), and the Pixi should look awfully familiar as well (8GB storage, WiFi, GPS, Bluetooth 2.1), though AT&T will be offering a variation with a blue back plate (in addition to the standard black and other swappable covers). Both UMTS / HSDPA devices will support AT&T's new Address Book service as a Synergy sync option, and will have free auto-connect access to the carrier's WiFi +20,000 hotspots. We don't know when we'll get our hands on these guys, but Palm will be showing off the AT&T-ified versions of the handsets at the upcoming CTIA... which we will of course be attending. It should be interesting to see if hopping on AT&T's network will move the needle for Palm, let's just hope those "coming months" are, you know... pretty soon. Full PR and one more pic after the break. SUNNYVALE, Calif., March 22, 2010 – AT&T's 80 million customers will soon have a new choice for staying connected in their fast-paced lives -- the Palm® webOS™ platform. Palm, Inc. (NASDAQ: PALM) today announced that the Palm Pre™ Plus and Palm Pixi™ Plus phones will be available on the nation's fastest 3G network for $149.99 and $49.99, respectively, with a two-year service agreement and after a $100 mail-in rebate. Pre Plus and Pixi Plus will be featured in Palm's booth (No. 7053) at CTIA Wireless, which runs March 23-25 in Las Vegas. 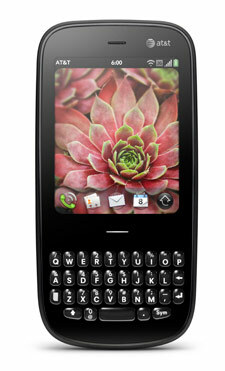 With a slider keyboard, a larger touchscreen and a high-performance processor, Pre Plus is Palm's full-featured Palm webOS phone. It's designed for people who want an easy-to-use phone with advanced features to help manage the different aspects of their lives, both personal and professional. The keyboard makes for quick and easy typing, while the unique gesture area provides a sleek look and intuitive navigation. Customers also get 16GB(1) of storage (~15GB user available) for applications and media. Pre Plus comes with the Palm Touchstone™ Back Cover, so it's compatible out of the box with the revolutionary inductive Touchstone Charging Dock (sold separately). As Palm's thinnest phone to date, Pixi Plus fits easily in your hand or pocket and offers a host of powerful features, including Wi-Fi. It's great for social communicators and first-time smartphone buyers who want an affordable and customizable phone with a full QWERTY keyboard instantly accessible for messaging and web content. Available in the original black as well as a new blue exclusive to AT&T, Pixi Plus is designed to let you express yourself. With the color Palm Pixi Touchstone Back Covers and the Palm Pixi Artist Series Back Covers (www.palm.com/artistseries), which are compatible with the Touchstone Charging Dock, you can easily switch covers to suit your mood and style (all sold separately at www.palm.com/store). Pre Plus and Pixi Plus showcase the defining features of Palm webOS, including the ability to run multiple applications simultaneously and easily move between them; the power of Palm Synergy™, which brings customers' information from the many places it resides into a single, more comprehensive view; unobtrusive notifications; and universal search. (2) Palm webOS also has a unique model of over-the-air software updates that delivers new features and performance improvements directly to a user's phone. Past updates have included support for 3D games and video recording allowing webOS customers to use their phones in fun, new ways. A significant advantage of Palm webOS applications is that they can be integrated into the core webOS functionalities, such as linked contacts, layered calendars, notifications and GPS, providing a rich catalog of innovative and unique offerings for Palm webOS users. The growing Palm App Catalog offers some of the best apps in the market – such as Pandora, Fandango, and rich 3D games like "Need for Speed™ Undercover" and "Guitar Hero" – unique in their high integration with the webOS device. Currently there are more than 2,000 applications for download. Pre Plus and Pixi Plus feature Wi-Fi connectivity, and AT&T customers with these devices will receive AT&T Wi-Fi access at U.S. hotspots included as part of their unlimited data plan. The phones transparently connect to Wi-Fi when in range of an AT&T hotspot, providing customers with fast and seamless access to music, email, video and the web. AT&T has the nation's largest Wi-Fi network with more than 20,000 U.S. hotspots.